Miranda has suffered a shocking loss of all she’s ever known and she’s desperately trying to find her way back to happiness. When she goes back home and starts spending time with her family’s handyman Dix, she thinks she may have found what she needs. Dix knows exactly who he is and he’s very comfortable in his skin. He is calm and peaceful and she finds comfort in his company. David is a rich kid who has rebelled against his upbringing. He has created a new persona and taken a new name to go along with it. Now known as Darius, he reads a lot of romance in order to hone his skills as a seducer of people. Darius fancies himself a foster figure and he founds a commune to take in wayward souls. Darius’s commune is called The Source and it’s a bit reminiscent of L. Ron Hubbard’s Scientology. Time reveals that Miranda’s troubles are more deep-seated than we know. She is completely the opposite of Dix. She picks at everything around her, she’s constantly irritated by her life and she just cannot find inner peace. As her relationship with Dix begins to fall apart, she is drawn to Darius and taken with his outlook on life. She wants to participate in the work he does at The Source and feels that it may give her life new meaning. But Dix is concerned about Miranda spending time with Darius. He begins to wonder what’s really going on out at The Source. 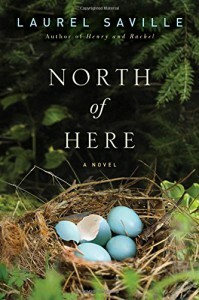 North of Here is an exploration of the human psyche. Whether a person is born rich or poor, they still need to find what might bring true happiness and purpose to their life. Ultimately happiness comes from within. People need to explore their inner psyche in order to understand who they really are and where they fit into the world. While this book makes a good point, I just wasn’t overly enthused. The overall atmosphere was somewhat dreary and I just didn’t find that one thing in this book that will make it memorable for me. The whole commune thing is overdone and I’m so bored with it. I think this one would really depend on each individual reader. I won a hardcover of this book and another one from Magdalena Johansson’s book blog A Bookaholic Swede. As you know, there are a lot of blogs for book reviews because those of us who are readers love to share our discoveries. In this big world of book reviewers, Magdalena is among the truly superb! Please check out her blog. I promise you’ll love it! I want to thank the publisher (Lake Union Publishing) for providing me with a copy of this book through A Bookaholic Swede’s blog contest for an honest review.